We call it the Product Recommender. We received a sizeable amount of requests asking for the option to send out product recommendations automatically. Up to this point, Omnisend users had to pick individual products and repeat the process for each and every campaign or automation flow. Sounds a bit tedious, right? The question our Product team had was not whether the feature was necessary, but rather how it should pull recommended products from your online store. In order to find out, we analyzed our biggest clients’ purchase patterns from Shopify. While our study showed quite a low confidence level in terms of predicting recommendations based on historic purchase behavior, we came up with a bit simpler, yet more accurate technique of suggesting relevant products. 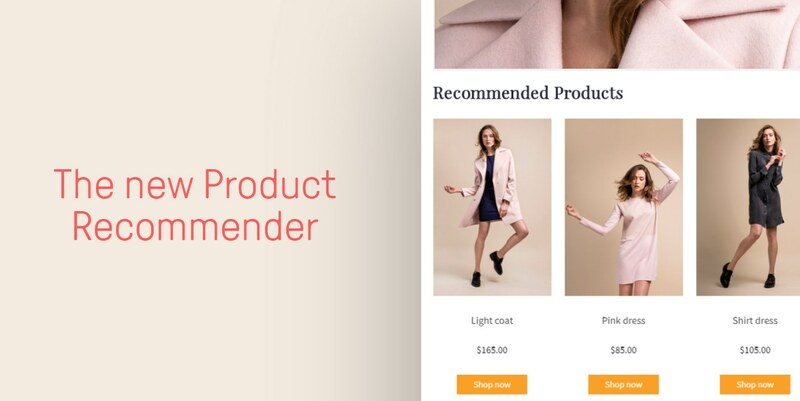 Eventually, Product Recommender was designed to allow our users to automatically import their top selling or newest products into their campaign and automation emails. The feature is available for all Omnisend users with a Standard or Pro plan and Shopify integration. As always, more nitty-gritty details about the Product Recommender can be found in our Knowledge Base. 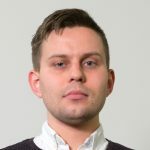 Besides improving Omnisend’s platform functionality, we’re always keen to share actionable advice. 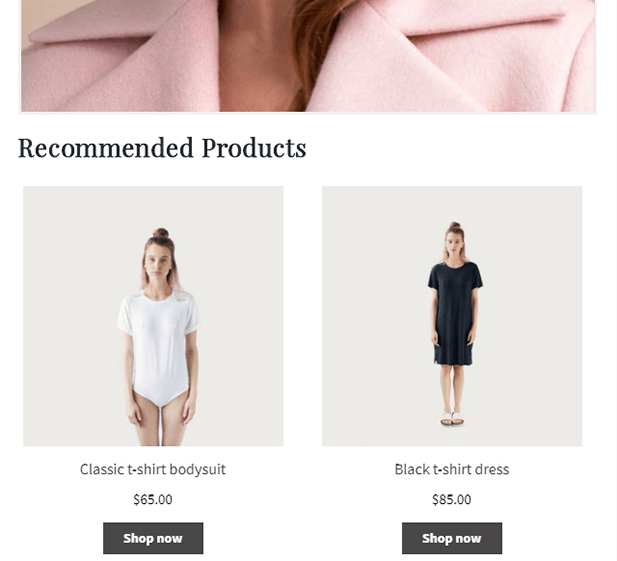 We hand picked 3 ready-to-use ideas for how you can benefit from Product Recommender and create a superior shopping experience for your customers. The Welcome email workflow is an essential element for establishing rapport with new subscribers and introducing your brand. Yet, with our new product recommendations, our users are able to not only tell, but also emphasize what makes the brand stand out. Your top selling products define your brand and you shouldn’t hesitate to display the products that make your business successful. Displaying your best sellers will do you a favor and act as a social proof, which in turn supports your marketing message. Product recommendations are a particularly powerful tactic if your store is offering high demand goods that are purchased on a regular basis. Coffee, vitamins, cosmetics, and edible goods are some great examples. Due to the cyclical nature, these products run out frequently and are consumed within predictable intervals. The tactic will also work for merchandise bought less regularly, although the trick here is to figure out historic repurchase patterns. The smart thing to do in this instance is to set up automated Customer Reactivation workflows with a friendly invitation (or two) to reorder. Make your best guess and send one email just before the product runs out and a follow-up email after the product is expected to be consumed. Your customers will appreciate this reminder and help your brand to stay on top of their mind too. 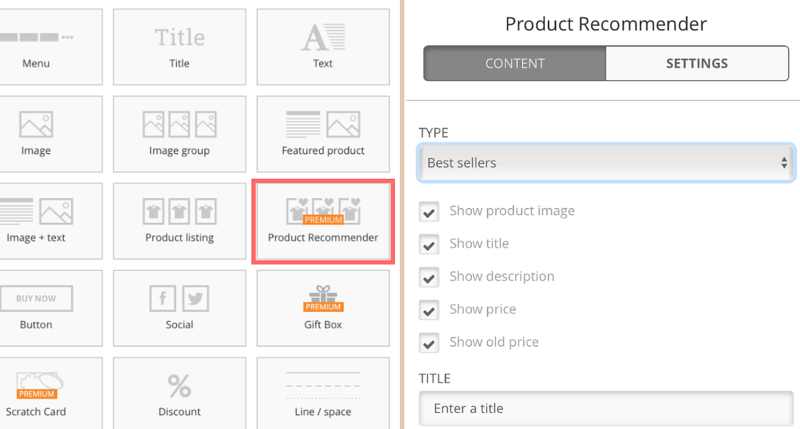 Lastly, another suitable place for Product Recommender is the Order Follow-up workflow. 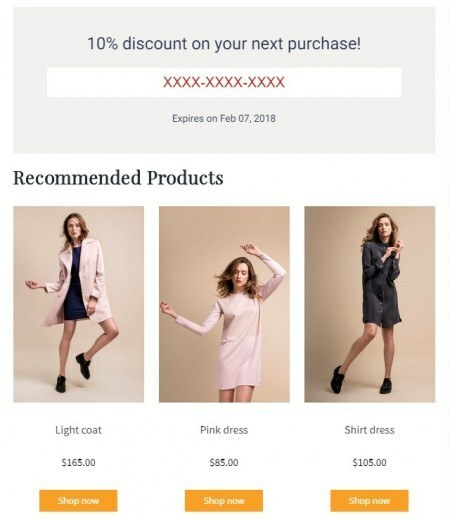 If you’re already asking your customers whether they’re satisfied with their last purchase, you could also enrich your emails with a new arrivals section. This is a great way to trigger interest without sounding intrusive. Along with Product Recommender, it’s now possible to create more coherent experiences for sales promotions. We suggest you complement your discount offers with closely placed product recommendations. Our platform has several discount offer formats (Discount, Scratch Card and Gift Box) and all off them work well with the Product Recommender. Just pick what works best for your business. This combo will give your shoppers a visual cue and a hint of where the discount is applicable. For shoppers, this works as a “shortcut” to reach the products faster, while helping you shorten your customer journey at the same time. On the other hand, there is a good chance that a portion of your shoppers are interested in recently added inventory. Stores that are adding a new range of products frequently or selling trendy items should seize this opportunity and be proactive. Got fresh inventory? Consider delivering campaigns that include your newest products. 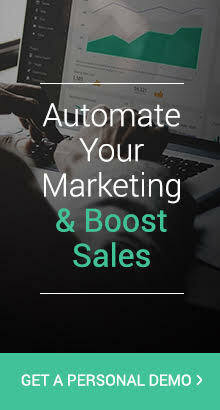 This tactic will help you to reach potential buyers instantly and, more importantly, eliminate the situation where your shoppers discover new products by accident or a couple of days later. We are nearly finished executing our What’s Next plan, with only one milestone left. Stay tuned as we plan to launch our new Smart Segmentations very soon. In the meantime, we’d love to hear from you. Have you started using our brand new Product Recommender yet? Got any great tips or feedback? Let us know in the comments below! – i have many free (digital) products on my site, and these get recommended as bestsellers, because they were downloaded the most. is it possible to base bestsellers on profit from a product rather than the number of times it’s been sold? or at least to rule out the free products when making the bestseller list? -I think that’s a great idea. We’re looking into that and will work on making the Product Recommender better and more flexible. I think a lot of merchants will enjoy this option. -Great that you’re pointing this out. We’re working on improving this aspect to avoid listing free products in bestsellers. We’re planning on rolling it out with our next update. If you’d like, we can send you an email when it’s ready. -For this point, I think it would be best if you contacted our support (support@omnisend.com). That way we’ll be able to get some specific details from you and help you out quickly.